We learned that Andy will be one of the speakers at the event “Speaking up for Heroes” on 16 July 2009 at the Royal Institution, London. “For one unforgettable night, several of the finest speakers in the UK will gather at the Royal Institution, London, to present on the subject of courage, of achievement, of overcoming impossible odds – to celebrate heroism itself. The cause for this evening could not be more relevant or noble; Help for Heroes is an organisation formed to help those who have been wounded in Britain’s current conflicts in Afghanistan and Iraq. They have raised millions of pounds over the last two years, and yet their work continues unabated. Speaking up for Heroes – the first event of its kind – will see great speakers celebrating and supporting our nation’s great heroes. Each speaker will talk of their own experiences, of great adventures, and give their own views on heroism, fortitude, courage and indefatigable will. This is your chance to be part of this unique event, and to help raise over £100,000 for Help for Heroes. Posted: June 24th, 2009 under Andy McNab, Andy McNab News, British Army, Charity, Help for Heroes, SAS, Special Forces. Gordon Brown cares more for Susan Boyle than Brits held hostage in Iraq, a furious dad claimed today. Desperate father Graeme Moore said the PM had never called him about his son Peter who was seized in 2007. But he was left fuming after it was revealed Mr Brown found time to check on the Britain’s Got Talent singer when she suffered with exhaustion. Andy was held captive in Iraq as a member of the SAS. There have been more private contractors killed in Iraq than US soldiers. I have spent 13 years on the board of a private security company working there. Everybody understands the risk and that’s why the pay is so high. I had one mate who was shot in both arms. When people are kidnapped, it tends to be by criminals and they get sold as a commodity. If you don’t get them back in the first few days – either by paying or by using force – they can be sold on to extremist groups. And then you are in trouble. I think that is what has happened here. It must be tough for the three remaining hostages. But the Foreign Office will do everything possible to get them back. Posted: June 24th, 2009 under Andy McNab, Andy McNab Interviews, Andy McNab News, British Army, SAS, Special Forces. “Food for Heroes is the work from a group of friends who were serving together at RAF Aldergrove in Northern Ireland. With a number of us having recently returned from deployments in Iraq and Afghanistan, the work that a newly formed charity “Help for Heroes” was trying to do truly struck a chord with us. The result is the book “Food for Heroes”, a cook book with a difference. Over a hundred contributors list, including politicians, sporting icons, celebrities and many others, have given up their time to tell us about their Heroes and what they would feed them. All of the recipes were cooked by our team of service chefs and photographed by Military photographers. The result is an intriguing smorgasbord of celebrity, nostalgia, bravery, humour and food which has developed into an extremely unusual cook book with a very different look and feel. “If it is true that an army marches on its stomach, then what more fitting way to raise money for injured soldiers than a cook book dedicated to heroes. Profits from the Food for Heroes cook book will benefit the charity Help for Heroes, which works to provide services for wounded armed service personnel. A hundred people were asked to nominate their hero and the dish they would cook for them, the book is the result. SAS soldier-turned-author Andy McNab said he would cook “the world’s hottest chicken curry” for his hero, pioneering Anglo-Irish explorer Ernest Shackleton. Posted: June 21st, 2009 under Andy McNab, Andy McNab Books, Andy McNab News, Books (other authors), British Army, Charity, Help for Heroes, SAS, Special Forces. Wearing a camouflage suit and tie, Stephen Colbert took his show to Baghdad to entertain U.S. soldiers in Iraq. For openers, President Obama appeared by video to thank the troops. “You’re welcome,” the mock pundit answered. “I wasn’t talking to you,” the president deadpanned. To the roaring approval of hundreds of troops at Camp Victory, on the western edge of Baghdad, Colbert taped the first of four episodes of “The Colbert Report,” in which he plays a pompous, blustering conservative TV host. His first guest was the towering, bald Gen. Ray Odierno. When Obama and the U.S. commander suggested Colbert had to look like a soldier to be a soldier, the general took an electric razor to Colbert’s perfectly parted cable-news coif. Posted: June 14th, 2009 under Andy McNab News, British Army, Special Forces. 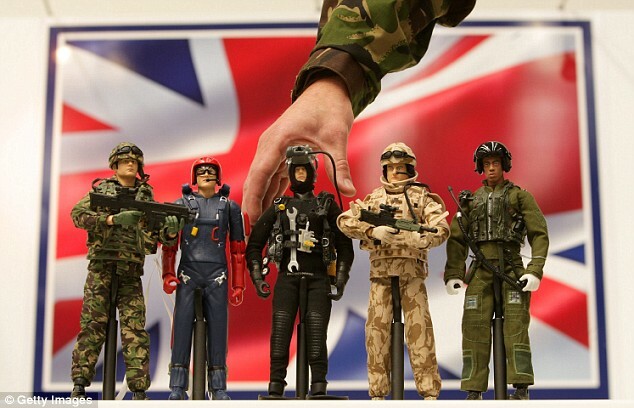 “The Ministry of Defence is helping to launch a range of toys based on British soldiers, sailors and airmen. Funny one I ran into, it’s from last month. There’s been quite some discussion about the MOD’s toy soldiers as you can read here in a Daily Mail article. Posted: June 13th, 2009 under Andy McNab, Andy McNab Interviews, Andy McNab News, British Army, SAS, Special Forces. Combat Stress charity auction: Andy McNab says: "an amazing cause"
Be the first civilian to ride in an Apache Helicopter !! ‘Buy Once Give Twice’ has teamed up with Combat Stress to offer you the chance to be the first ever civilian to ride in an Apache helicopter. Capable of travelling at speeds of over 170mph and cruising at up to 21,000 feet, this is a once in a lifetime opportunity that money can buy! To have a chance of flying in this two-seater state-of-the-art military helicopter, all you need to do is place a bid on the Buy Once Give Twice charity auction site. The auction is only open till noon on Thursday 11th June so put your bids in as soon as possible and all proceeds go to the Combat Stress charity. “It is an incredible honour for someone to fly in an Apache Helicopter, a once in a lifetime opportunity!” says former British solder and author of Tumbledown, Robert Lawrence MC. The online auction closes at noon on the 11th of June. However it will be taking place as a live auction in the evening at Combat Stress’s 90th Anniversary Gala Dinner. Place an auto bid to secure your entry! Posted: June 9th, 2009 under Andy McNab, Andy McNab News, British Army, Charity, SAS.